In their simplest incarnations—a line for an I, a circle for an O—letterforms reveal their true nature: they are forms first, letters second. The connective tissue that transforms a circle into a letterform is only as strong as the imagination and consensus of the community for whom that circle represents the letter O. For some communities the O is a rectangle, for others it is a lozenge balanced between parallel horizontal lines. To tell either of these communities that their Os are not Os is as futile as telling a speaker of one language that he ought to be speaking another. These variable permutations of abstraction and legibility are the source of the alphabet’s dynamism, and it is in the boundary between these two states that I enjoy spending my time. 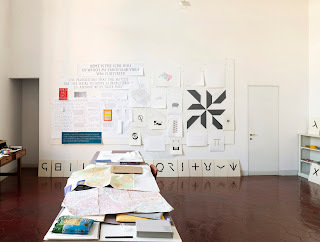 Roma Abstract is based closely on a geometric alphabet I painted while at the American Academy in Rome. When I first arrived for my fellowship in Rome, I did so with a high level of anxiety. I felt an intense pressure to produce work, and from my first day at the Academy I could feel the time slipping away. In an attempt to calm myself, I painted a seven-inch diameter circle on a wooden panel. As people visited my studio they would unfailingly remark on the “O” on my wall. Each time I would tell them that it was not an O but a circle, and each time they responded that they had assumed that it was a letterform because I had drawn it. I had become the O’s contextual source of legibility, it was through me that the circle became an O. By the fourth or fifth such conversation, I began saying that the circle was an O, and proceeded to paint the remaining twenty-five letterforms in the alphabet. 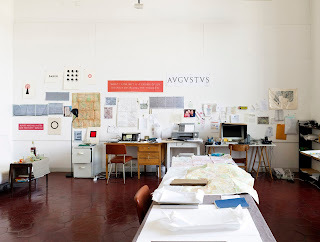 The west wall of my Rome studio with the circle/O to the left on the wall. The east wall with many of the original Roma Abstract paintings along the floor. The finished alphabet borrows from Greek, Etruscan, and Roman alphabetical marks to create a set of twenty-six forms that require their neighbors to be understood. They are legible, but only just so. As a group, the letterforms also evoke the diversity of alphabetical history, calling into question the recurring desire to find an idealized alphabetical form. After returning to New York in 2010, I digitally traced the letterforms and used them at greatly reduced size on my MMXI new year’s card and on a page of Specimens of Diverse Characters. Although I liked the smaller printed versions, something was missing. The original scale of the painted letters was critical to their reading as monumental forms that had been degraded and deprived of their full meaning. Since printing Specimens I have wanted to print the letterforms of Roma Abstract at their original size. 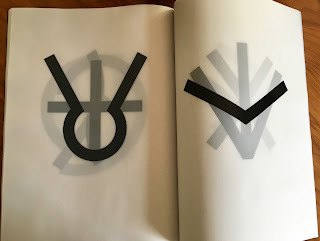 The problem I faced was that I did not simply want to make a facsimile of the painted alphabet, and I could not find a compelling exterior reason to print the book. So I put the idea aside and waited. Then increasingly over the last two years I have come to feel that every aspirational symbol of culture and civility has been abstracted into unrecognizable ciphers; and any stable understanding I thought I had of a Roman ideal has been shattered by the steady onslaught of global social and political upheavals. My illegible alphabet suddenly makes sense, has gained in legibility within the current political context. What grew out of a desire to challenge the Roman ideal suddenly changed into a lament of its passing. In contrast to the original alphabet in which each letterform was painted on its own wooden panel, the letterforms in Roma Abstract are printed on translucent paper to emphasize their communal aspect—rather than standing alone, each letter is supported and explicated by those around it. The book’s cover is printed with the text from the inscription on Trajan’s column, the letterforms of which are widely regarded as the apotheosis of Roman alphabetical form. Set in the letterforms of Roma Abstract, this Trajanic benchmark of enlightened Imperial form is rendered nearly illegible, echoing the absurd mockery of statehood in which we find ourselves living. Detail of the cover with the text from the inscription on Trajan's column set in Roma Abstract. Detail of the cover and slipcase. Opening showing the U and the V.
The printed sheets laid out for collation in my studio, with Nancy Loeber collating below.